HAPPY EASTER AND HAPPY PASSOVER FROM LOCAL SPINS! The DAAC is reopening its doors, three years after it was forced to move. Musician John Hanson has felt the power of the all-ages arts collective, inspiring this guest column for Local Spins. It’s Back: After years of performances and more on S. Division Avenue, The DAAC has a new home. EDITOR’S NOTE: This guest column is one of a series of essays giving a voice to West Michigan musicians on topics dear to their hearts — assessing the highs and lows of the music scene, in their own words. Today, as the DAAC prepares to reopen at a new site, musician, photographer and videographer John Hanson presents his “Ode to the DAAC” and how it’s shaped his art and that of many other young musicians and artists. 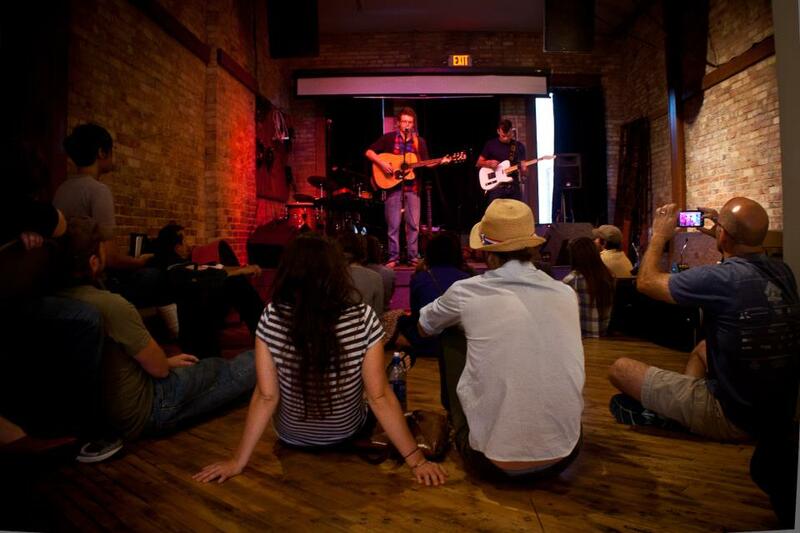 I played my first show at the DAAC in 2009, opening up for Michigan favorites Breathe Owl Breathe. I was awestruck that such a space could exist – full of attentive people who were there purely for the music, run by a collective of artists and creatives who were working together to keep it that way. This was a place unlike other venues and instantly became a favorite. 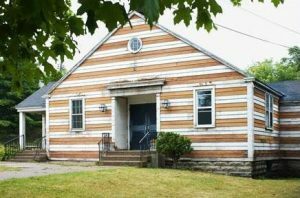 Throughout the next two years, I would continue to play gigs at the Division Avenue Arts Collective – then housed on S. Division Avenue – and once I moved to Grand Rapids in 2011, I joined its board of directors. For 12 years, the DAAC has showcased visual art, workshops, film screenings and most commonly music. And its strict “safe space” policy (no drugs, no alcohol, no jerks) has enabled people who are under 21 to attend all events there. This is a pretty big deal considering most people who play music start in their childhood or teenage years, not after they are 21. In a city so saturated with 21-and-older venues, an alternative performance space for its youth is a vital resource. The DAAC helps ensure a future population where creativity is valued and shared through developed practice and exposure to outside ideas and influences. New Home: The Rumsey Street house. The DAAC also promotes a music/art focused space, where audiences listen and respect for the music is commonplace. The types of exchanges that happen in the DAAC are priceless. It has not only provided me with a platform to make meaningful connections to a national network of artists but connected me to my own neighbors as well. This environment simply encouraged collaboration. Incubating this greater creative community in our city and region, the DAAC is one of many all-ages spaces like it speckled throughout the country. It’s also a place where I learned how to become proficient at production; running sound, designing and distributing posters and live performance among many other things. The DAAC is a community resource designed to empower and encourage its supporters, and foster relationships in artistic communities. The open house is Saturday. Nearly three years ago, the original DAAC building was sold and it was forced to close its doors. But with an incredible boost of support from our community, the DAAC started a fund-raising campaign to raise capital and set a course to eventually find a new home. It was amazing to see so many people supporting the cause from around the country. So many people’s lives have truly been touched by the DAAC as it served them in their development. Big and small contributions came in attached with emails sending love and encouragement. This weekend, the DAAC opens its doors again. The new location at 333 Rumsey St. SW in Grand Rapids will provide regular programming and serve as a community space and project incubator in the southwest corridor of the city. 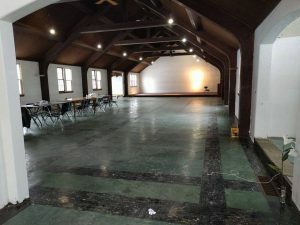 The space is an old catholic church and is almost 4 times larger than the original DAAC space. Quadruple the Size: DAAC’s Rumsey Street site. 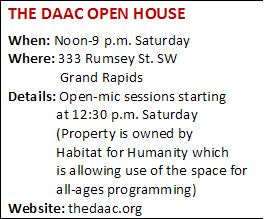 On Saturday, the DAAC will host a full day of open-mic sessions and give the public a chance to view the space. Get details online here, with signups for the open-mic sessions available on a separate page. Once again, the DAAC is poised to fulfill its mission of providing a safe and neutral space for people of all ages to participate in cultural production. So if you’ve had that inkling to book a show, learn how to run sound, host that poetry reading, film screening or get that study group started and need a space, the DAAC could be your ticket. After all, it was started by the people for the people. 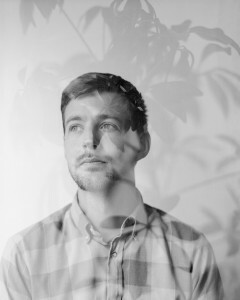 ABOUT JOHN HANSON: John Hanson is a photographer, film producer and musician living in Grand Rapids. He is the founder of the Lamp Light Music Festival and serves on the board of directors at the Division Avenue Arts Collective. See his work at www.johnmarkhanson.com. And for more information about the DAAC and to donate to the cause, visit thedaac.org.